I believe that the Java Man fossil is the best evidence for Creation! “During the dry season of 1891, Dubois conducted excavations on the bank of the Solo River in central Java, near the village of Trinil. In September, they turned up a particularly interesting item–a primate tooth, apparently a third upper right molar, or wisdom tooth. Dubois, believing he had come upon the remains of a . . .
ordered his laborers to con­centrate their work around the place where the tooth had turned up. In October, they found what appeared to be a turtle shell. But when Dubois inspected it, he saw it was actually the top part of a cranium, heavily fossilized and having the same color as the volcanic soil. The fragment’s most distinctive feature was the large, protruding ridge over the eye sockets, leading Dubois to suspect the cranium had belonged to an ape. The onset of the rainy season then brought an end to the year’s digging. In a report published in the government mining bulletin, Dubois made no suggestion that his fossils belonged to a creature transitional to humans. In August 1892, Dubois returned to Trinil and found there-among bones of deer, rhinoceroses, hyenas, crocodiles, pigs, tigers, and extinct elephants-a fossilized humanlike femur (thighbone). This femur was found about 45 feet from where the skullcap and molar were dug up. Later another molar was found about 10 feet from the skullcap. Dubois believed the molars, skull, and femur all came from the same animal, which he still considered to be a. . . giant chimpanzee. In 1963, Richard Carrington stated in his book A Million Years of Man: “Dubois was at first inclined to regard his skull cap and teeth as belonging to a chimpanzee, in spite of the fact that there is no known evidence that this ape or any of its ancestors ever lived in Asia. It was only in 1894 that Dubois finally published a complete report of his discovery. Therein he wrote: “Pithecanthropus is the transitional form which, in accordance with the doctrine of evolution, must have existed between man and the anthropoids.” Pithecanthropus erectus, we should carefully note, had itself undergone an evolutionary transition within the mind of Dubois, from fossil chimpanzee to transitional anthropoid. the Pithecanthropus skull was in the range of 800-1000 cubic centimeters. thus placing the Trinil skull midway between them. To Dubois, this indicated an evolutionary relationship. But logically speaking, one could have creatures with different sizes of brains without having to posit an evolutionary progression from smaller to larger. Furthermore, in the Pleistocene many mammalian species were represented by forms much larger than today’s. 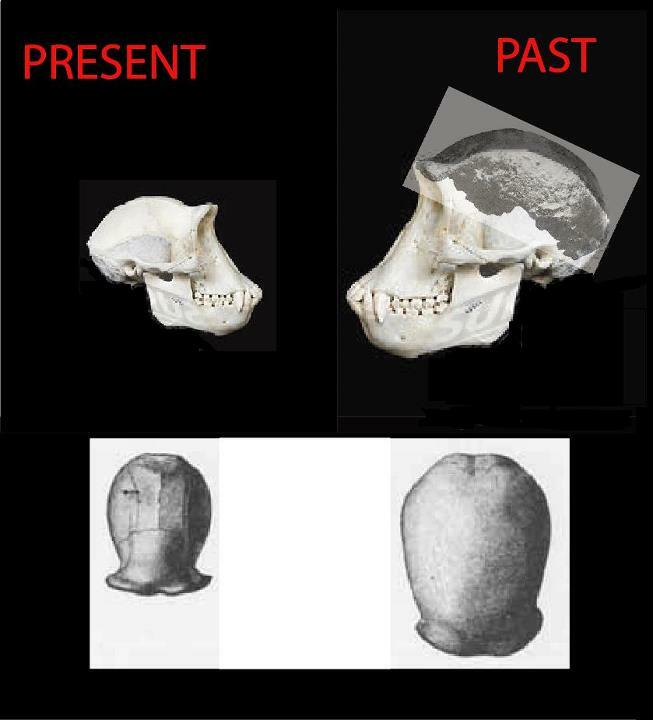 Thus the Pithecanthropus skull might belong not to a transitional anthropoid but to an exceptionally large Middle Pleistocene gibbon, with a skull bigger than that of modern gibbons. There is no reason to believe that it was anything but politics that persuaded Dubois from his original professional assessment. Peer pressure from peer review (government peer review) altered his professional honest assessment. This fossil is the fossil of a Giant Chimpanzee. It may be the most important fossil in Devolution theory. It is the Greater Ancestor of Chimpanzees. Forget the road to man imagery what about the road to Chimpanzee, that goes from this mega-faunal chimpanzee to the chimpanzees of weaker descendancy. As you can see in the comparison to the chimpanzee skull it is a perfect match for a mega-faunal Chimpanzee. As a matter of fact there had to have been one because all animals had a greater ancestor in the past. As sure as Gigantopithecus Blacki is the mega-faunal gorilla, there had to be one for a chimp. Some may cling to the idea that this was a giant gibbon, and there were indeed giant gibbons, however i stand with Dubois before the intrusion of others two cents. In the moments of honesty when fame, and heroism were not in his eyes, when fear or peer was not threatening his livelihood, before a colleague who was known for being a sharleton of fake embryonic artwork, . . . . . . i stand with Dubois then, that this is indeed a giant chimpanzee!!! Wow!!! just saw the first of your links a 31 1/2 foot ape fossil. Keep stuff like that coming!